1.1.0.1 Before designated as Park Raya Tourism Park area named Dago waterfall. Then because some community leaders calls for the means of education, research, training and extension open in nature, is also provision nuftah plasma source descent, nature tourism facilities, dampening flood, erosion for the city of Bandung, as well as Remind the greatness of the name of a hero Ir.H. Juanda. Finally on the 14th of January, 1985, Tourism Park Dago waterfall turns into Forest Park (THR) Ir.H.Juanda. 1.1.0.2 Juanda Forest Park better known as Dago Pakar is at 7 km north of Bandung in Dago jl.Bukit North. This area is also located in the Village District of Cicadas Ciburial, partly into Mekarwangi Village area, Langensari Village, and the Village Cibodas Lembang, Bandung regency. 1.1.0.3 Location Forest Park area is located approximately 7 miles darts Bandung center can be reached by all types of motor vehicles. When using public transport can be reached through the terminal Dago, including the major public transport station-Dago, Kalapa-Dago, Riung Bandung-Dago, and Ciroyom – Ciburial. Before designated as Park Raya Tourism Park area named Dago waterfall. Then because some community leaders calls for the means of education, research, training and extension open in nature, is also provision nuftah plasma source descent, nature tourism facilities, dampening flood, erosion for the city of Bandung, as well as Remind the greatness of the name of a hero Ir.H. Juanda. Finally on the 14th of January, 1985, Tourism Park Dago waterfall turns into Forest Park (THR) Ir.H.Juanda. Juanda Forest Park better known as Dago Pakar is at 7 km north of Bandung in Dago jl.Bukit North. This area is also located in the Village District of Cicadas Ciburial, partly into Mekarwangi Village area, Langensari Village, and the Village Cibodas Lembang, Bandung regency. Location Forest Park area is located approximately 7 miles darts Bandung center can be reached by all types of motor vehicles. When using public transport can be reached through the terminal Dago, including the major public transport station-Dago, Kalapa-Dago, Riung Bandung-Dago, and Ciroyom – Ciburial. Regions Juanda Forest Park occupies an area of 590 acres. Besides having beautiful scenery, also equipped diverse species of flora and fauna could be said that the tourist attractions are handled by Perum Perhutani Unit III West Java, is a paradise for nature lovers. No wonder on holidays invaded by residents. The most interesting of these Juanda Forest is a secondary natural forest and vegetation composition of plant with butane mixture consisting of trees (2500 species) are included in the familia and 108 species of plants and plant underground .. Historical district that we can see is a Dutch heritage cave contained in a valley. 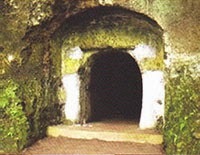 It is said that these caves were made by the Dutch government at the expense of many lives of the people of Indonesia. Satisfied enjoy the scenery here we continue running around the forest area. From cave Dutch heritage, moved to Japan Cave which is about 1 km. Invisible striking difference between the two caves of this colonial legacy. Only the outside of the cave Japan does not wear like iron door of the cave Netherlands. To enter these caves, visitors can ask accompanied by a guide who roam the torch equipment. Although not much to see in it, many foreign and domestic tourists who are curious look into it.